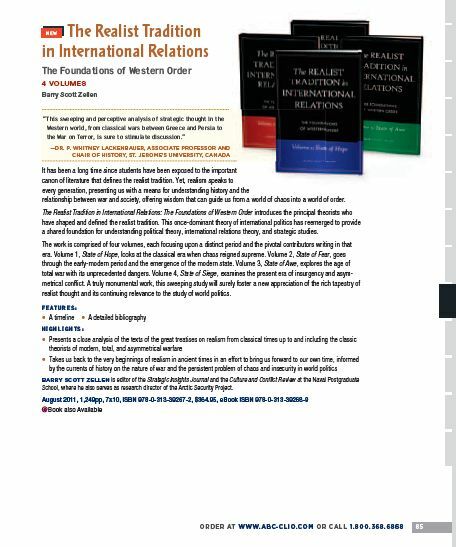 In August 2011, Praeger Security International (PSI) published my four-volume series on the philosophy of war and state, and the convergence of political, strategic and IR theory around the nexus of constructive realism -- the millennial effort by theorists across history to render chaos to order with the stroke of a pen. 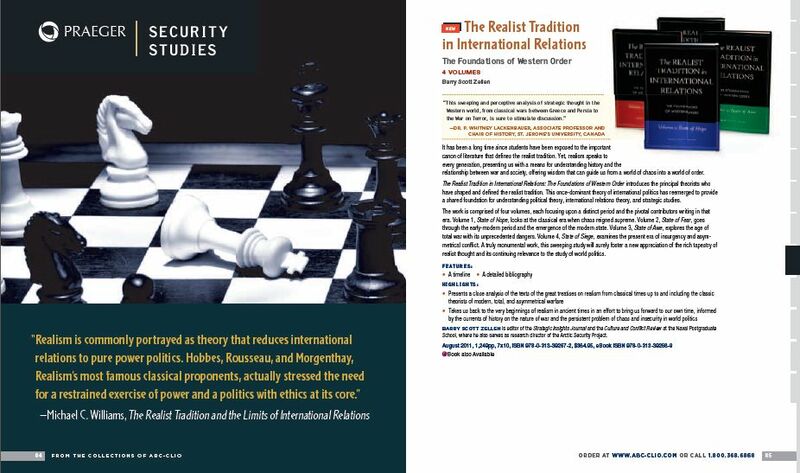 Formerly called States of Mind: The Realist Tradition and Foundation of Western Order, its now known as The Realist Tradition in International Relations: Foundations of Western Order. "Heavy reading. Zellen has a writing style that strikes a balance between scholar and poet as he traces Realism from Thucydides to Hitler. This first book in his four volume series is extremely informative. ..."
-- Dr. Andrew Robert Thomas, Assistant Professor of International Business at the University of Akron, where he also serves as Associate Director of the Taylor Institute for Direct Marketing. He is founding editor-in-chief of Journal of Transportation Security and author of The Handbook of Supply Chain Security (Springer, 2009); editor of Aviation Security Management (Greenwood, 2008), and author of Aviation Insecurity: The New Challenges of Air Travel (Prometheus, 2003). -- Dr. Timothy R. Tangherlini. Tangherlini teaches folklore, literature and cultural studies at the University of California, where he is a Professor in the Department of Asian Languages and Cultures, and in the Scandinavian Section. He is also an affiliate of the Center for Medieval and Renaissance Studies, the Religious Studies Program, and a faculty member in the Center for European and Eurasian Studies and Center for Korean Studies. -- Dr. Julian Reid, Professor of International Relations, University of Lapland; author of The Liberal Way of War: Killing to Make Life Live (Routledge 2009) with Michael Dillon. The work is comprised of four volumes, each focusing upon a distinct period. Volume 1, State of Hope, looks at the classical era when chaos reigned supreme. Volume 2, State of Fear, goes through the early-modern period and the emergence of the modern state. Volume 3, State of Awe, explores the age of total war with its unprecedented dangers. Volume 4, State of Siege, examines the present era of insurgency and asymmetrical conflict.